You don't need any complicated techniques to make the most delicious and moist meatloaf. There are simply a few gems of advice that are easy to follow. Once you get the hang of it, you will be a meatloaf master and have your family looking forward to this favorite comfort food. No matter which meats you decide to use, the right ratio of lean meat to fat is a critical factor in determining the texture and moisture of your meatloaf. A ratio of 80 percent meat to 20 percent fat is the generally accepted formula. Some cooks use 30 percent fat, but there is a fine line between juicy and greasy. This is the reason most cooks choose ground chuck since it has this ideal proportion of fat to meat. During cooking, the fat will liquefy, making the meatloaf moist. If you are making a meatloaf with a leaner protein such as chicken or turkey, you will need to add more liquid to the meatloaf to replace the juices that would be produced by the fat. By adding finely diced or pureed aromatic vegetables to your mixture, you are adding additional moisture into the meatloaf. Not only does this make your final product juicier, but it also adds lots of extra flavor. A wide array of vegetables can be used, including onions, carrots, celery, green peppers, red peppers, and summer squash. One tip is to sauté them in butter or olive oil before adding them to the meatloaf. This will ensure they release more of their moisture into the meatloaf. The function of breadcrumbs in meatloaf is to absorb and retain the juices so you have a moister loaf. Meat by itself will simply drain away the juices and end up dry. A percentage of 15 to 25 percent breadcrumbs in relation to the meat is common in most of today's recipes. Especially if you are using leaner meat, you may want to soak your breadcrumbs in a little milk or stock before adding them to the meatloaf. Breadcrumbs were originally added to the meat to stretch it so a pound of meat made a loaf big enough to feed a large family. Some recipes from the 1930s actually called for a 50 percent ratio of breadcrumbs. That's definitely putting the loaf in the meatloaf. Mixing your ingredients too much is a very common mistake that can really make for meatloaf with a tough, dry texture. Self-control is the key; once the ingredients are mixed in, stop. Remember, the meatloaf is going to be mixed more as it's shaped before baking. When shaping your loaf, looser is better. Don't compress the meat too much or it will need to cook longer. This can lead to a drier loaf. 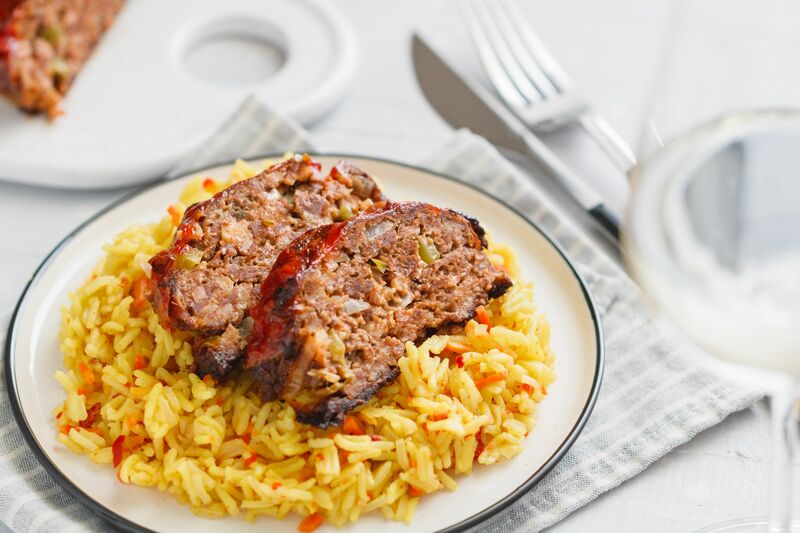 Some recipes have you cook your meatloaf at temperatures as high as 425 F. Noted food authority Alton Brown says that the ideal oven temperature for a moist meatloaf is 325 F. If the oven is too hot it will reduce the cooking time, but it tends to dry out the meat. If you cook your meatloaf too long, it will become dry. But it needs to reach a safe temperature for food safety, so you don't want "rare" meatloaf. Detecting whether the meatloaf is done based on cooking time just doesn't work. There are many variables your recipe can't account for, including how thick you shaped your loaf and whether your oven's temperature is properly calibrated. A thermometer takes away all those variables. Cook your meatloaf to an internal temperature of 155 to 160 F. The temperature inside the meatloaf will rise after you take it out of the oven. You will be rewarded with a moist loaf every time. You may be used to letting steaks and roasts rest for 10 minutes before slicing or serving. Resting is also beneficial for meatloaf. It allows the temperature and juices to even out throughout the loaf. If you simply began slicing the meatloaf, you would see more juices lost on the cutting board.